This is a free version with limited features. For full features and TVOS App, please look for the Pro version. In the past, 3D Modeling requires state-of-the-art computing machines and advanced graphic programming for a building or object. 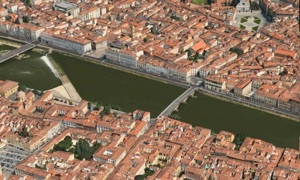 With Apple Map flyover, 3D Cities and Places around the worlds are now available on your iOS devices. (This app is part of the Universal Purchase. 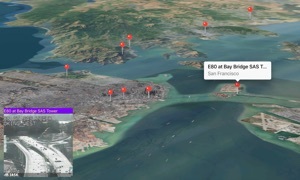 With one purchase, you will be able to see the 3D Cities and Places on your iOS, Watch OS and Apple TV devices.). The motivation of this app is to get your the quickest access to the cities and places you can start to explore the fantastic 3D View and explore cities and places in a wonderful experience. > Cities and Places with flyover support around the globe are listed. 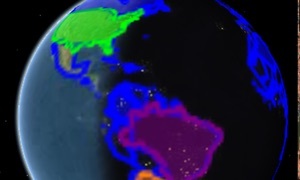 Zoom in/out and select any city/place to see the 3D View. > Smart tip: from the "Normal" map view to find out any POI and enable the 3D Building View (two-fingers gesture to change viewing angles: zoom in/out, rotate, swipe up/down for 3D View) and then click on "Flyover" to switch to 3D Flyover View. 2. "New York City" 3D View should appear. 3. You can use two-fingers gesture to change viewing angles: zoom in/out, rotate, swipe up/down for viewing the city details. 1. Select "Paris, France" from the map or from the table. 2. Switch to "Normal" map view and find the "Eiffel Tower" on the map. 3. You can use two-fingers gesture to change viewing angles: zoom in/out, rotate, swipe up/down for 3D View. 4. Switch back to "Flyover" view to see the 3D View. > Launch the Watch App and the app will communicate with the iOS App to get the nearest city/place and also notify the iOS App to select and view the city/place. Click on the "Nearest" button if you would like to search the nearest city/place again. - One click City/Place selection by selecting the table and click on a location.